Gujarat Co-operative Milk Marketing Federation Limited (GCMMF), the largest food products organization of India has announced the launch of “Amul Camel Milk” in a select few markets of Gujarat. These include Gandhinagar, Ahmedabad and Kutch. Sourced from Kutch, the milk will be available in a 500 ml PET bottle priced at Rs. 50. It needs to be refrigerated with a shelf life of 3 days. The lunch is scheduled for Wednesday, that is today. Camel milk is easy to digest and rated healthy due to its numerous benefits, most prominent of which is that the milk is high in an insulin-like protein, making it beneficial for a diabetic person. Sahjeevan NGO, Bhuj and Kutch District Co-operative Milk Producers’ Union Limited, Sarhad Dairy have organized camel farmers. The initiative will give farmers better prices and will benefit consumers by giving them hygienically processed, superior quality camel milk. It is noteworthy that the Government of Gujarat has provided subsidy for setting up new plants in Kutch district of Gujarat for the processing of Camel milk. Camel milk is being used for thousands of years across various cultures and benefits of the camel milk even receive mention in Ayurvedic texts. Research articles have suggested that the Camel milk is also beneficial to those having dairy allergies as it contains no allergens. 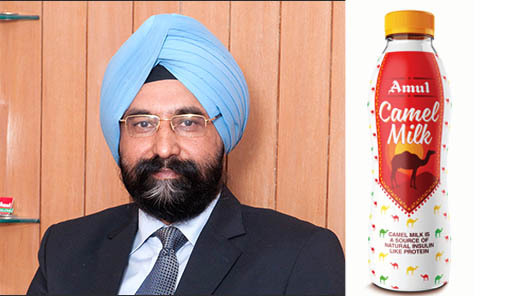 It is important to mention that the Amul group has achieved sales unduplicated turnover of Rs. 41,000 crore during 2017-18. 80-85% of consumer rupee is passed back to milk producer members thus encouraging them to produce more milk. Amul has been an outstanding example of the power of farmer’s cooperative movement born way back in 1946, before India gained Independence. Amul has now become a household name and all Indians have tasted Amul products at different phases of their life.